No. 16 TCU overcomes slow start to rout SMU Sept. 7, 2018, 10:49 p.m.
Area Sports Menu for Saturday, September 8 Sept. 7, 2018, 10:10 p.m.
Cardi B escorted out of fashion party after lunging at Minaj Sept. 7, 2018, 9:55 p.m.
Jewell Loyd, Breanna Stewart lead Storm to Game 1 Finals victory Sept. 7, 2018, 8:26 p.m.
Neymar leads Brazil past U.S. before sparse crowd Sept. 7, 2018, 7:32 p.m.
Rafael Nadal’s injury sends Juan Martin del Potro to U.S. Open final against Novak Djokovic Sept. 7, 2018, 7:20 p.m.
Xander Schauffele steals show in second round of BMW Championship Sept. 7, 2018, 7 p.m.
White Sox’s top pitching prospect Michael Kopech will likely need Tommy John surgery Sept. 7, 2018, 6:34 p.m.
Heidi Klum and Tim Gunn leave ‘Project Runway’ for Amazon Prime Video project Sept. 7, 2018, 3:43 p.m.
Vince Vaughn charged with DUI, failing to comply with police Sept. 7, 2018, 3:16 p.m.
Mac Miller found dead inside home of suspected overdose Sept. 7, 2018, 2:33 p.m.
Carolyn Hax: Parents deny cash-strapped kids financial and emotional support Sept. 7, 2018, 1:58 p.m.
Travolta wants to hear toy stories for this year’s Christmas show Sept. 7, 2018, 1:32 p.m.
Once a staple of light comedy, Steve Carell has rebranded himself Sept. 7, 2018, 11:30 a.m.
‘Rel’ gets early jump on fall TV season flood Sept. 7, 2018, 11 a.m.
Miss Manners: When confronting hate, consider both etiquette and safety Sept. 7, 2018, 9:50 a.m. Grip on Sports: Football movies were always better when Burt Reynolds smiled Sept. 7, 2018, 8:57 a.m.
College volleyball: Eastern Washington wins twice to improve to 7-2 Sept. 7, 2018, 10:20 p.m.
Women’s soccer: Eastern Washington blanks Colorado State on the road Sept. 7, 2018, 6:23 p.m.
Men’s soccer: No. 17 UC Davis shuts out Gonzaga Sept. 7, 2018, 5:59 p.m.
Gonzaga volleyball knocks off California for first victory of season Sept. 7, 2018, 4:46 p.m.
Reid Hatley wins Pacific Northwest Golf Association Men’s Mid-Amateur Championship Sept. 7, 2018, 4:21 p.m.
Reliving Rodin: Jundt Art Museum opens exhibit of works by the father of modern sculpture Sept. 7, 2018, 6 a.m.
Another day at Tesla: Execs depart, Musk invites controversy Sept. 7, 2018, 5:44 p.m. Grocery Outlet on Sprague Avenue closes after 29 years Sept. 7, 2018, 4:12 p.m. Modest premium hikes as ‘Obamacare’ stabilizes Sept. 7, 2018, 9:26 a.m.
U.S. hiring picked up in August as pay surged most in 9 years Sept. 7, 2018, 8:49 a.m.
Tesla stock falls as CEO Elon Musk appears to smoke marijuana on video Sept. 7, 2018, 8:13 a.m.
British Airways travelers’ credit card details hacked Sept. 7, 2018, 8:10 a.m. Suspect appears in court following North Spokane shooting Sept. 7, 2018, 8:10 p.m.
Cannabis retailers, artists celebrate Spokane with custom murals Sept. 7, 2018, 2:45 a.m. The High Road has big plans for big plants Sept. 7, 2018, 2:33 a.m.
Blue Roots Cannabis continues to branch out Sept. 7, 2018, 2:26 a.m. Taking the mysteries out of CBD Sept. 7, 2018, 2:09 a.m. Skip the line by ordering online Sept. 7, 2018, 1:07 a.m.
Big sky picks: Eastern Washington, Montana State have stiff road tests Sept. 7, 2018, 8:51 p.m.
Strong-armed showdown: Eastern Washington’s Gage Gubrud, Northern Arizona’s Case Cookus set to air it out Sept. 7, 2018, 8:46 p.m.
Central Valley School District teachers vote overwhelmingly to approve now contract Sept. 7, 2018, 7:36 p.m.
Gifting action for Grandparents Day Sept. 7, 2018, 5 p.m.
First Avenue Coffee goes green Sept. 7, 2018, 11:26 a.m.
Prep football roundup: Konner Kinkade and Isaiah Strong help Pullman cruise past North Central Sept. 7, 2018, 11:13 p.m.
University holds off Post Falls in 43-37 thriller Sept. 7, 2018, 11:08 p.m.
‘Slick’ Shilo Morgan helps Coeur d’Alene stay unbeaten with 47-34 win over Mead Sept. 7, 2018, 10:47 p.m.
Stout defensive effort, quick start leads Lewis and Clark to 34-8 victory over Davis Sept. 7, 2018, 10:35 p.m. Girls soccer roundup: McKenzie Letsch’s go-ahead goal leads North Central over East Valley Sept. 7, 2018, 10:01 p.m.
Prep cross country: Lewis and Clark, Kamiakin headline strong field at Tracy Walters Invitational Sept. 7, 2018, 9:59 p.m.
Northern Idaho woman denies theft from midwifery clinic Sept. 7, 2018, 12:37 p.m.
Police: 2 from Idaho dead after being hit by car in Vegas Sept. 7, 2018, 12:31 p.m.
Idaho schools chief switches up rural school pitch Sept. 7, 2018, 12:26 p.m.
New test will better measure Idaho students’ reading skills Sept. 7, 2018, 12:24 p.m.
Idaho football hopes to bounce back quickly against Western New Mexico Sept. 7, 2018, 6:51 p.m.
John Blanchette: Dennis Erickson embarks on another coaching journey while being honored for his time at Idaho Sept. 7, 2018, 5 a.m.
MLB roundup: Astros beat Red Sox 6-3 in matchup of A.L. leaders Sept. 7, 2018, 9:24 p.m. The End of a Voyage: Will Sterling’s Final Inning at Centene Sept. 7, 2018, 4:11 p.m.
Washington’s Charlie Albright stars in Spokane Symphony’s season opening show Sept. 7, 2018, 12:01 a.m.
Thirteen join Basketball Hall of Fame Sept. 7, 2018, 9:07 p.m.
Company offers to drop Stormy Daniels’ hush-money agreement Sept. 7, 2018, 7:50 p.m. Pipeline company found guilty in 2015 California oil spill Sept. 7, 2018, 5:49 p.m.
Hurricane Florence could cause dangerous surf along U.S. coast Sept. 7, 2018, 3:25 p.m. Under Betsy DeVos, full loan relief rare for for-profit students Sept. 7, 2018, 2:40 p.m.
Ex-Trump campaign adviser George Papadopoulos sentenced to 14 days in jail Sept. 7, 2018, 2:29 p.m.
Nike’s Kaepernick campaign signals change in shoe politics Sept. 7, 2018, 1:09 p.m.
Trump says he’s ready to tax an additional $267B in Chinese imports Sept. 7, 2018, 12:17 p.m. Immigrant families struggling with trauma of separation Sept. 7, 2018, 12:12 p.m.
Twitter’s Alex Jones ban: Blip in sea of abuse? Sept. 7, 2018, 10:36 a.m. Wildfire closes key California highway through the weekend Sept. 7, 2018, 10:01 a.m.
Obama issues scathing critique of Trump, ‘politics of fear’ Sept. 7, 2018, 9:52 a.m.
Giuliani: Trump won’t answer obstruction questions Sept. 7, 2018, 9:04 a.m.
GoFundMe, law firm says homeless Samaritan will get cash Sept. 7, 2018, 8:41 a.m.
Senate concludes Kavanaugh hearing; confirmation likely Sept. 7, 2018, 8:37 a.m.
Trump: Russia probe ‘really, really unfair for the midterms’ Sept. 7, 2018, 8:18 a.m.
Trump urges Justice Department to unmask ‘resistance’ writer Sept. 7, 2018, 8:07 a.m.
Police say Cincinnati shooter’s gun jammed during office rampage Sept. 7, 2018, 8:01 a.m.
Dallas officer in shooting to be charged with manslaughter Sept. 7, 2018, 7:48 a.m.
Death and Disappearance: Haunting stories behind missing posters of Native women Sept. 7, 2018, 6 a.m. Lawmakers seek answers for why Native American women vanish Sept. 7, 2018, 6 a.m.
Ammi Midstokke: That time a worst nightmare came true Sept. 7, 2018, 5 a.m.
Aretha Franklin dresses, hats to go up for auction Sept. 7, 2018, 10:08 a.m. Final night of prelims Friday in swimsuit-less Miss America Sept. 7, 2018, 8:58 a.m.
Film academy president says popular Oscar was misunderstood Sept. 7, 2018, 8:32 a.m.
Masahiro Tanaka shines, Gleyber Torres and Andrew McCutchen homer as Yankees blank Mariners Sept. 7, 2018, 10:04 p.m.
Seahawks have yet to make decision on activating Earl Thomas Sept. 7, 2018, 3:16 p.m.
100 years ago in Spokane: Former football star earns Croix de Guerre Sept. 7, 2018, 8:20 p.m. Youngest rodeoers at Spokane County Fair test their skills at mutton bustin’ Sept. 7, 2018, 7:12 p.m. Prosecutor deems officers justified in March shooting at Hillyard apartment building Sept. 7, 2018, 5:29 p.m.
Pathway closes in Riverfront Park for winter work on future site of Centennial Trail Sept. 7, 2018, 5:24 p.m.
Mayor David Condon vetoes renewable electricity law, calling it unaffordable and unattainable Sept. 7, 2018, 4:35 p.m.  Feds and ranchers working to find land to settle Snake River property disputes Sept. 7, 2018, 6 a.m.
Spokane County clerks candidates differ on experience, goals for reform Sept. 7, 2018, 4 a.m.
Chi Chi Gonzalez helps Spokane Indians earn spot in Northwest League championship series Sept. 7, 2018, 5:17 p.m.
A community ‘Chorus Line’ comes to Lake City Playhouse Sept. 7, 2018, 11 a.m.
‘God Help Us!’ brings legendary actor Ed Asner to NIC Sept. 7, 2018, 9:12 a.m.
No. 9 Washington hosts North Dakota as warmup for Pac-12 play Sept. 7, 2018, 6:58 p.m.
Washington State sees plenty of itself in nonconference matchup versus San Jose State Sept. 7, 2018, 6:21 p.m.
Two minute drill: Keys to victory for Washington State against San Jose State Sept. 7, 2018, 3:24 p.m.
ESPN to air College GameDay feature on tragic bond between Ivan Maisel, family of ex-Washington State QB Tyler Hilinski Sept. 7, 2018, 11:46 a.m.
For Washington State’s Patrick Nunn and San Jose State’s Leki Nunn, a long journey comes full-circle Saturday night Sept. 7, 2018, 6 a.m. Judges: No penalties but Washington teacher strikes illegal Sept. 7, 2018, 3:03 p.m.
Judge tosses lawsuit over car-tab taxes for Puget Sound mass transit Sept. 7, 2018, 2:10 p.m.
Family of unarmed man killed by police settles for $13M Sept. 7, 2018, 12:29 p.m. Teen accused of shoving friend off bridge appears in court Sept. 7, 2018, 10:54 a.m.
Strike by Western Washington crane operators, others appears to be over Sept. 7, 2018, 7:47 a.m.
Nearly 90 elephants killed for tusks near Botswana wildlife sanctuary, group says. Government disputes claim. Sept. 7, 2018, 6:06 p.m.
Letter confirms Vatican received McCarrick complaint in 2000 Sept. 7, 2018, 2:36 p.m.
Palestinian teen killed by Israeli fire at Gaza border rally Sept. 7, 2018, 1:17 p.m.
Iraqi protesters set fire to Iran consulate in southern city Sept. 7, 2018, 12:51 p.m.
Back to school, but not for all of Syria’s children Sept. 7, 2018, 12:06 p.m.
Japan quake toll up to 18 as rescuers dig through landslides Sept. 7, 2018, 9:41 a.m.
Book on Trump raises worries in South Korea about alliance Sept. 7, 2018, 9:35 a.m.
U.S. Defense secretary makes surprise visit to war-weary Kabul Sept. 7, 2018, 9:14 a.m.
Iran, Russia, Turkey presidents meet in a high stakes summit on Syria Sept. 7, 2018, 9:08 a.m.
EU says Serbia, Kosovo talks end without breakthrough Sept. 7, 2018, 8:45 a.m.
Yemen peace talks uncertain as rebels fail to attend Sept. 7, 2018, 7:56 a.m.
Stabbing of candidate shakes Brazil’s presidential race Sept. 7, 2018, 7:54 a.m.